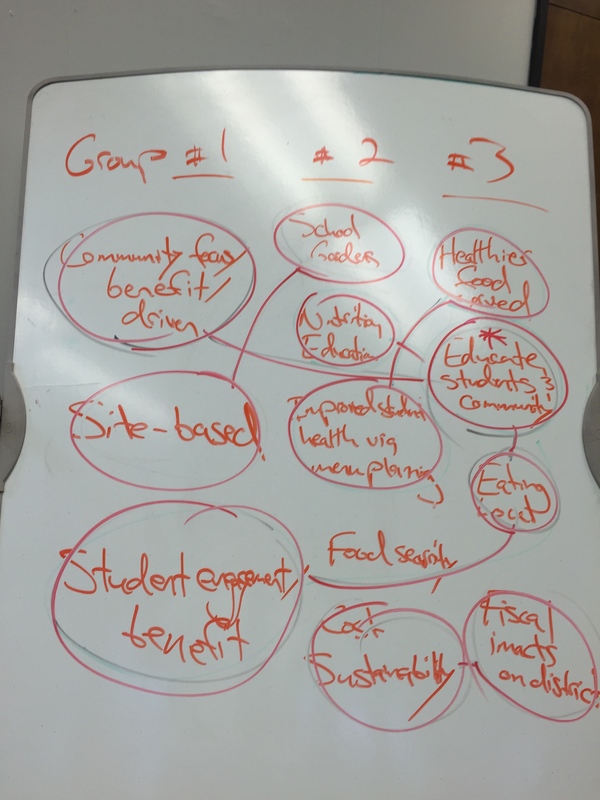 In July of 2015, CHIP facilitated farm-to-school visioning sessions at Vista Unified School District (VUSD) and Sweetwater Union High School District (SUHSD). The goal of these sessions was to invite stakeholders from across the district and community into the planning process and ask, “What do you want farm-to-school to look like in your school district?” The sessions were part of CHIP’s work to guide both districts in developing a 3-year farm-to-school plan. Vista and Sweetwater were selected through this opportunity through a competitive application process for which CHIP received five applications. Unfortunately we could select only two districts, and Vista and Sweetwater rose to the top. 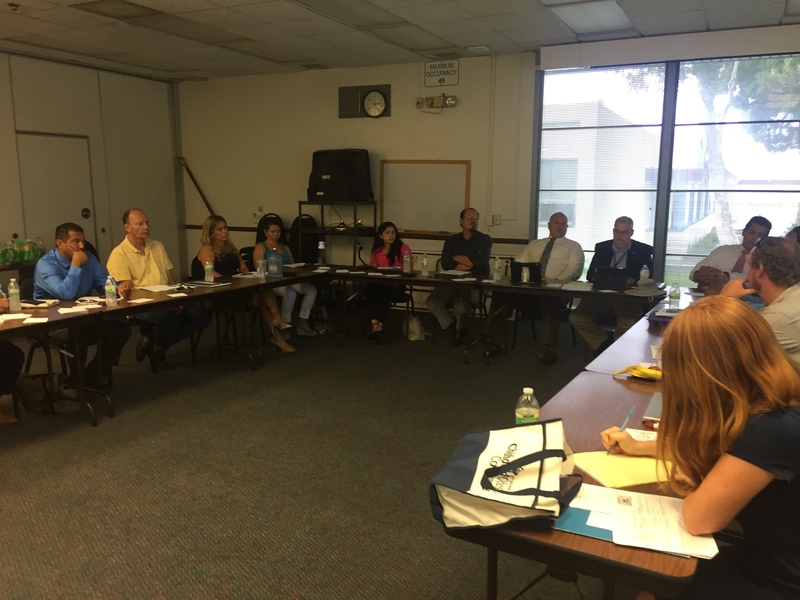 Vista’s farm-to-school visioning session was held on July 22nd at VUSD. The gathering was co-planned and facilitated by CHIP food systems staff and the VUSD project lead Amy Haessly. Amy is the Registered Dietician for VUESD’s Child Nutrition Services Department. Amy’s positive energy is contagious and she could not be a better leader to advance this work at VUSD! As a testament to this, Amy rallied over 30 district staff and community stakeholders to attend the visioning session, including the VUSD Superintendent! Those in attendance included district teachers, curriculum specialists, nutrition services staff, grounds management, Solutions Farms (from which VUSD already buys all their greens! ), VUSD’s produce distributor, the Vista farmers market manager, marketing specialists, food systems advocates, and more. For the majority of the gathering, attendees worked with one another through interactive exercises to identify common goals of farm-to-school at VUSD. 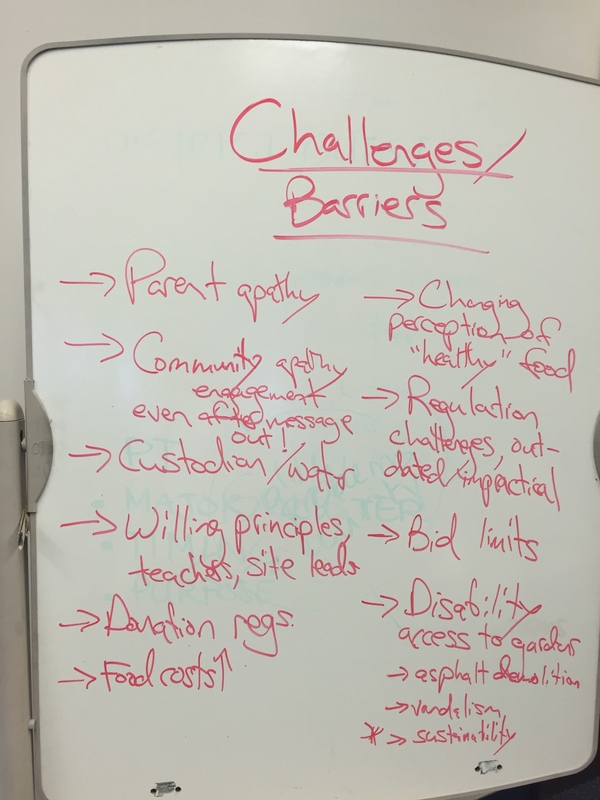 The farm-to-school visioning session at Sweetwater was held on July 30th. The gathering was co-planned and facilitated by Eric Span, the Director of Nutrition Services for SUHSD. Eric has big ideas for SUHSD and the community in which it is situated, and is willing to work with a diverse and multi-sectoral range of partners to make those big ideas a reality. Eric gathered nearly 20 farm-to-school stakeholders from across the district and community including district staff, teachers, a SUHSD Principal, their produce distributor, and community members. The session at Sweetwater followed a similar format to that of Vista’s, with an added emphasis on prioritizing community engagement in SUHSD’s farm-to-school activities. 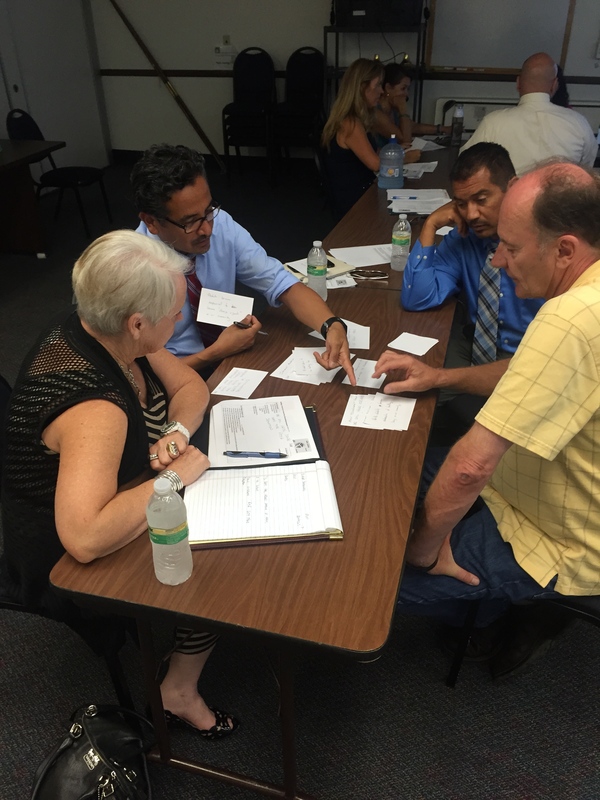 Attendees worked with one another through interactive exercises to identify common themes and goals of farm-to-school at SUHSD. At the end of each session, attendees identified challenges and commitments moving forward. CHIP took all this information back and is now working through it with the Vista and Sweetwater project lead’s to identify strategic opportunities. “By engaging in farm-to-school activities, students at Vista will make healthier food choices, advance their educational and professional goals, and use F2S as a platform for engaging with the local community, environment, economy, and food system. This vision statement was recently shared with other farm-to-school stakeholders in San Diego County at the September 11th meeting of the San Diego Farm to School Taskforce. Fellow districts applauded their efforts and inquired how they can conduct the same process. CHIP shared that it will hopefully be able to offer this opportunity for up to 4 districts in 2016. Both districts are currently working with CHIP to dig into the commitments and challenges identified by visioning session participants. We look forward to bringing you another update in November about how this process advances at Vista and Sweetwater!